The Swedish band Deville is a group that is currently creating some of the strongest and most melodic rock music of any band currently creating rock music. The four-man band consists of vocalist and guitarist Andreas Bengtsson, guitarist Jan Persson, bassist Markus Åkesson and drummer Markus Nilsson, although Martin Hambitzer was guitarist for the band when they created their newest album. The style of the band takes rock from the likes of Black Sabbath and combines it with rock influenced by Soundgarden. 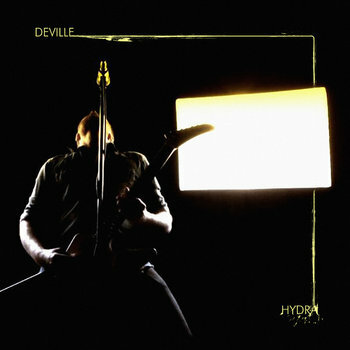 The 2013 album from Deville is entitled Hydra. When listening to Hydra from Deville, the listener hears a band that takes itself seriously when creating their music. The music created by the band seems to be powerful from the first note and just never lets up. The album is just the thing for music lovers who enjoy a lot of energy in their listening pleasure. Hydra from Deville begins with the track “Lava”. “Lava” is a track that brings together the sound of Soundgarden and Queens of the Stone Age. The first thing that the listener will notice with the song is the speed at which the track hits you. That pace comes courtesy of drummer Markus Nilsson who provides an unforgiving beat that really makes the song move along with a quick pace who helps to produce a rather energetic track that sets the album off with tons of energy. The resulting rock song is a solid track that features a fresh, modern sound that could fit in on any modern rock station or Alternative rock format. The track “Iron Fed” is one of the hardest rocking songs of the album. Like the track before it, the song comes with a driving feel to the pace of the music. The guitars on this track also add a whole lot of energy as the entire band combines to produce a track that combines elements of early Alternative Rock with more current influences. What results is truly one of the best and strongest tracks on the album. One of the strongest tracks on the Hydra release from Deville is the track “The Knife”. The first two minutes of the song deal with lyrics about a man in pain. But it’s the second half of the track that really caught my attention. The second half of “The Knife” is one of the most impressive instrumental jams to come along in a while. Deville takes the groove that was laid down in the first half and continues the instrumental feel of the piece until the pace and style of the music segues into something with a lot more melody. The music takes on a stronger groove and quicker pace while allowing the band to show off some of their talents as a band as a whole. It is with the song “Over the Edge” that Deville seems to give the listener a slight reprieve from the relentless pace of the first two tracks of the album. While the band slows the pace of the music down for the track “Over the Edge,” that hardly means that the band eases up on the power behind their music; the track is as strong as any of the other songs that have a quicker pace. Just like the track “Over the Edge,” “Burning Towers” has a slightly slower pace to the music. With this track, the person who stands out the most is vocalist and guitarist Andreas Bengtsson who gives the track an equal amount of power on the guitar and on the vocals. With this track, Bengtsson’s vocal delivery on “Burning Towers” is strong and shows that he can survive with the best rock vocalists that have come before him. The track “Blood Crown” is yet another song that stands out on the Hydra release from Deville. The song features a very commercial feel to the music and is one of the tracks on the album that could have you jamming along with the music. The Hydra release from Deville comes to an end with the track “Stay a Little Longer”. The track has a lighter, more commercial feel to it than most of the songs on the album. That does not, however, mean that the energy level is diminished. “Stay A Little Longer” feels like it would have been right at home on any Alternative Rock and/or Power Rock radio format. The track even features a refrain that will grow on you. When you listen to the newest release from Swedish rock band Deville, you get an album of rock and roll that features a whole lot of power and energy while still containing a lot of fun moments. If you are a fan of bands that feature loud guitars, a lot of energy along with talented playing and writing, Sweden’s Deville is a band you need to check out and their album Hydra is one that needs to be heard. Click HERE to check out the song “Burning Towers” from Deville. Check out more releases from the band’s label Small Stone Records.